And the autumn gypsy jazz hotness starts tonight! 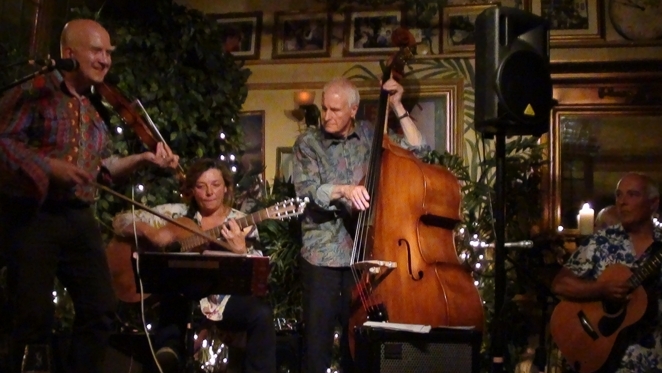 FiddleBop are playing for the first time at The Greedy Goose (Salford Hill, Chastleton, near Moreton-in-Marsh, Gloucs GL56 0SP) from 7 pm on Friday 26 September. Fine food and drink will be there for your delectation in this friendly and somewhat renowned eatery, together with (of course) FiddleBop's eminently tasty jazz swing. And we've a Special Guest! So how about exploring the Greedy Goose tonight? There's more! On Friday 3 October we are at Balscote Oktoberfest: the Butcher's Arms (Balscote, Oxon OX15 6JQ) will be celebrating, Bavarian style! With great food and beers and a warm welcome from Ken the landlord, this will be a cosy and fun gig! It's an 8.30 pm start, see you there? Then we have The Norman Knight (Whichford, Warwicks CV36 5PE) which is another favourite haunt for FiddleBop. We will be returning to Tim's pub on Saturday 11 October. This award-winning pub is a cracker! Always something different in the way of beer, and as for the food... yum! We'll kick off about 8 pm, and maybe landlord Tim will join us on his cajon. We've more gigs in November, but I'll save them for the next newsletter. Looking back at our recent gigs: we've had a great summer! Pimms and summer sunshine (well, mostly) were especially memorable features of our al fresco gigs on the terrace of the National Trust's Upton House. And our first gig at Le QuecumBar in London was one I'll never forget, and not just because of the amazing support from our friends, droves of whom who traipsed all the way to Battersea High Street just to hear us. Thank you! (You know who you are...) There are videos of the gig on our website. And we are back at Le Que again next year! OK it's time for me to do something useful, rather than just wittering on here... See you soon at a FiddleBop gig? Hope so! This list is correct at the time of writing, but the list of gigs on our website is always up to date. And for the latest and greatest, most up-to-the-second info on FiddleBop's small doings (can you stand to wait for it? ), see http://www.facebook.com/FiddleBop.